Is this a First World War monument? In a recent post here Jonathan Weier compared official plans in the UK and Australia to commemorate the First World War centennial with the Canadian government’s disengagement with the one-hundredth anniversary of the First World War. Given the interest the federal Conservatives have shown in warrior nationalism and war commemoration, this is surprising. From the government’s memorialization of the War of 1812, which includes a website, you would think it would be excited by the prospect of commemorating Canada’s Great War. The National Day of Honour it held this past 9th of May seems like more evidence for this assumption. Announced by the Prime Minister’s Office this past March, the honour day was “in recognition and commemoration of Canada’s military mission in Afghanistan.” You can find video of the day’s events on the Prime Minister of Canada YouTube channel (and, you know, subscribe if you want). Weier suggests some reasons why the government may be biding its time on commemorating 1914-1918. He also says the government’s reticence to commemorate the centennial may not be a bad thing. Might it lead to a greater diversity in how the war is remembered, and what is remembered? Perhaps it will. We are already seeing examples of Canadian society responding to the centennial with memorial/historical projects of various kinds. Let’s commend York University’s history department for producing a series of videos on the history of the First World War accessible on its website. The Toronto Star may be the biggest First World War history voice in Canada right now, thanks to its current “Walking the Western Front” series. I saw in the news that the Manitoba Archives has mounted an in-house and online exhibit of First World War material, and will be blogging about it. Of course, you can always find First World War history at the Canadian War Museum; it is featured most prominently in its online educational resources under the “Education” tab. Do these examples of reflections on the First World War benefit from the absence of special commemorative interventions by the federal government? Or is the reverse true: would more people become interested in the centennial and visit First World War history sites in person and online if elected leaders in Ottawa spoke out about the war? I suspect the latter is true. Clearly, government-led commemorations attract the most media attention, and we can expect this to be the case on upcoming Remembrance Days regardless of any lack of special programming. But governments do not own commemoration, or singularly curate the meaning of war remembrance, and neither does the larger state that government directs. However important political leadership is for the history of war, making war and remembering war are social processes. The remembrance of the First World War offers us plenty of evidence of this. And it occurs to me that remembrance is itself an aspect of the war’s centennial we would do well to reflect on. There can be no one “right way” to commemorate the war, but what if we were to focus on the war’s commemoration during the past century, rather than on the war that took place a century ago? One benefit of this approach is that it can emphasize the significance of 100 years. Yes, “100” it is a nice round number and an anniversary worth paying attention to for its symbolic power. But it also functions as a convenient marker of the quite real passing of memory into history. According to the Telegraph, the last First World War veteran died in 2012 (Wikipedia’s entry on Harry Patch is informative too), and there are few people left in the world with any personal memories of the war era. This passing of memory, in the personal sense, happens all the time – but that’s the point. We can make the centennial an opportunity to be a little more aware of this transformation in our collective relationship with the past. We can think about whether we have lost something with the passing of personal First World War memory, and whether we have gained something. Are we freer to engage with the war in new ways, or doomed to forget its lessons? Another advantage of this approach is its ability to bring more people in touch with the presence of this past in everyday life, for the First World War left a powerful legacy of public remembrance. The poppy, November 11th, and phrases such as “Lest We Forget,” are familiar parts of this legacy. In my area of Toronto you can see plaques, engraved stones, and stained-glass windows commemorating First World War service and sacrifice inside and outside local schools and churches. Such examples are evidence of communities of memory, both in the sense of the school communities and congregations that organized to create this material memory, and the subsequent generations who inherited these memorials. They also speak of a mass experience of war that generated responses throughout society. The nearby Legion hall offers another glimpse of this. 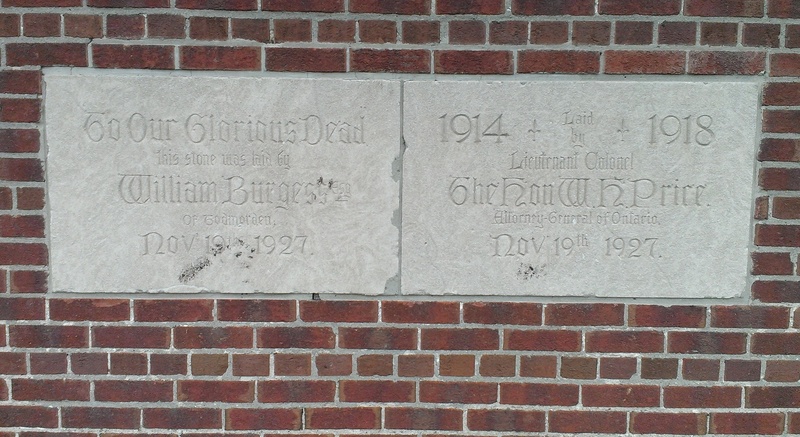 It was built after the First World War for veterans, and, as the building’s dedication stones reveal, in recognition of the fallen. Burgess was a long-time local resident who was important to school governance in the area. Price was a provincial Cabinet Minister and a First World War veteran. Younger communities in Canada may not have First World War memorials, but chances are good that a place name, building, or architectural feature commemorates one or more of Canada’s later wars. Most civic memorials commemorate multiple wars, as the one in my area does. A small plaque on the side of this memorial tells us it was recently re-furbished, which is more evidence of the ongoing relevance of commemoration. Located a block away from this site is the monument pictured at the start of this post. It relates to the legacy of the First World War in the eastern Black Sea region, a multi-ethnic borderland. Between 1914 and 1922, war, civil violence, and atrocities blighted the region as the Ottoman and Russian Empires fought, collapsed, and then vied for influence in the area as the emergent Turkish state and Soviet Union. 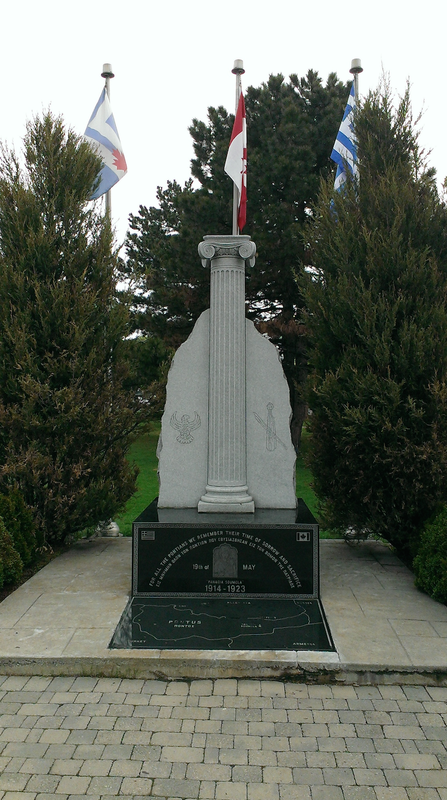 Erected (it seems) in 1999 by the Brotherhood Pontion Toronto, the Pontian Memorial suggests the integration of a new community of memory into Toronto. The monument is a reminder of the war’s transnational significance, and can be read as evidence of the contested nature of historical memory. The monument remembers the “sorrow and sacrifice” of “all the Pontians” in the 1914-1923 period, a reference to what the Center for the Study of Genocide and Human Rights at Rutgers University calls a genocide of Greeks under Ottoman rule. References to the expulsion of the Pontians, and the death of “all Hellenes who died in Pontos” that appear in documents accessible online were avoided in the monument’s final form for something less controversial. On their own, memorials and commemorative acts do not offer rich insight into the complexity of the past. The remembrance of the past, rather than the study of it, tends to promote crystallized meanings important to communities, however they may be defined. But that does not separate collective memory from history; the social remembrance of the past is a part of continuity and change over time. Across the one hundred years that separate us from the First World War, this remembrance of the past remains for us to engage with on a first hand basis. Why not use the commemorative legacy of the First World War as a touchstone for reflecting on the 100th anniversary of a complex, global war that affected Canada in many ways. This is a great reflection on commemoration and the First World War. While these examples of monuments and plaques show continuity of remembrance, I’m often struck by the ways in which the neglect of monuments can show public forgetting or disinterest in the past. How many First World War plaques, statues, and other pieces of memorial infrastructure sit forgotten or neglected across Canada? 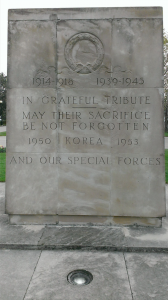 How many Canadians remember why Remembrance Day is held on November 11? 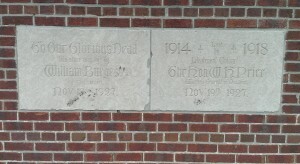 How many “memorial” buildings to the First World War get confused for commemorations of the Second? I’d like to see a post about some of these neglected monuments. Anyone else?